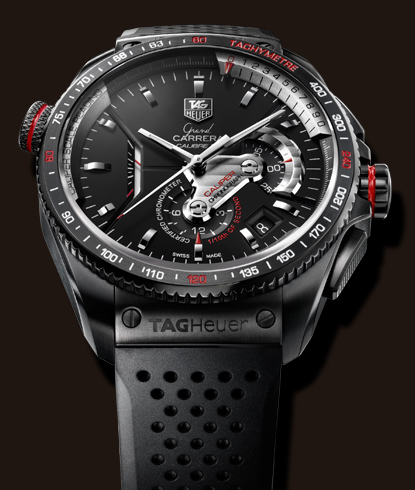 Tag Heuer has revolutionized watches once again with its new concept, Grand Carrera Pendulum, which virtually eliminates the hairspring contained in automatic watches and is now replaced with invisible magnets. This new designed was unveiled at the recent Baselworld 2010 watch show in Switzerland with rave reviews. The balance wheel now operates in a completely different fashion and is driven not by devices such as a metal coil strip, electronics or driven actuators, but rather the magnets. This allows the watch to resist gravitational changes, which results in superior timekeeping. The oscillator beats at 43,200/hour or 6 Hertz, all without the use of the hairspring. The Grand Carrera Pendulum Concept offers more precision and better performance than its predecessors of three centuries of watches for two reasons. First, it breaks the mold with no loss of amplitude, a common issue in hairspring watches. Second, the movement’s frequency is fine tuned on a very large spectrum of frequency without sapping the power supply, thus increasing the lifespan of the watch for decades to come. The design of the Grand Carrera has not changed and remains elegant with its polished edge work, and curved and faceted horns on both sides of black titanium covered steel case. The face of the watch still displays the special dial aperture at 9 o’clock. While the new design will not replace the hairspring watches it will no doubt enhance the TAG Heuer collections and become a special edition.